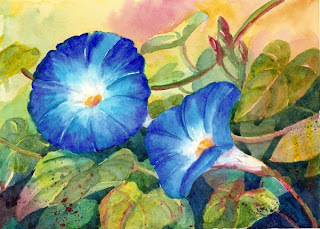 Today I did a very lively painting of Heavenly Blue Morning Glories. There is movement in the flowers, leaves and vines as if you can see the plant actively growing toward the sun. I took a brush loaded with paint and splattered color on the bottom leaves as well to enhance the feeling of movement.